Joe Davis, Greg Marek, James Woods and Matt Richards – hail from diverse musical backgrounds around the Capital Region of NY. Influenced by jam bands, jazz legends and classic rock, they fuse their influences to create a unique style of songwriting and collective improvisation. 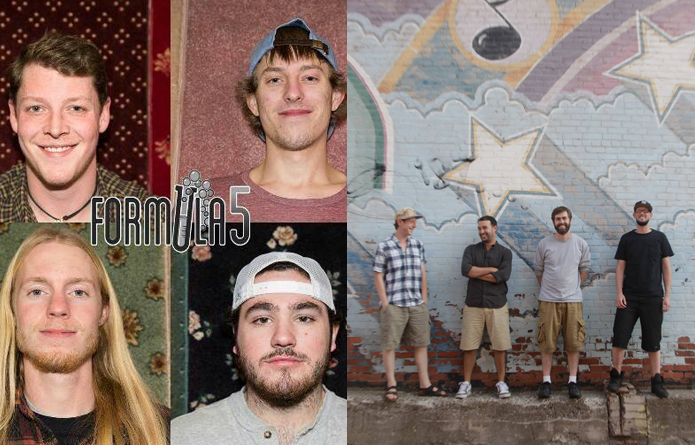 Formula 5 ties originals and select covers together with a remarkable approach to instrumentation and improvisation. Whether they are playing with Twiddle, TAUK, Particle, Kung Fu, Assembly of Dust, Dopapod, Spiritual Rez, and The Heavy Pets, or gracing the stages of Northeast festivals such as Catskill Chill, Disc Jam and Buffalove, Formula 5 has continued to grow rapidly, winning over new fans throughout the Northeast and beyond. For the latest, news, updates, tour dates, videos, merchandise, and more visit www.Formulafivemusic.com and be sure to catch the band in a city near you. With their unique sound mixing traditional rock structure, and complex developmental jamming, Space Junk evolves house, rock and jazz influenced improvising as the force to separate them from your typical solo based Jam band. Each show is a unique musical journey – ensuring that no two shows are the same. Their loyal fan base ties this live intelligent dance party together, sure to keep your feet moving, your blood pumping, and your brain in a frenzy. Unofficially formed in 2009 while attending college in Fredonia, Space Junk got its name and a new home in Buffalo, NY in 2011. Joining forces with Buffalo’s Frosty Tone DJ crew, Space Junk proved that a live band could hold their own with the late night DJs and MCs. Here they established their long form improvisational development, reminiscent of their DJ influences and counterparts in Trance, DnB, Dubstep and House. Maintaining a presence amongst the DJs and Jam bands in the Allentown bar district, they continued to push the limits of their tension filled peaks. They have shared the stage with acts such as Dopapod, Particle, Dr. Fameus, Consider the Source, Kung Fu, Digital Tape Machine, Jimkata, The Heavy Pets and many more. They where awarded Best Rhythm Section at the WNY Music Awards ceremony in 2013. And in 2016 Space Junk was voted the #1 electronic band by Western New York News. Close your eyes during one of their jams and you will see these analog musicians transform into one digital beast. Fueled by heavy delays, face-melting guitar solos, mind bending electro-funk jams, and an ambidextrous drummer/DJ/keyboardist [Yes, their drummer does all three simultaneously], Space Junk is bound to leave you stuck in orbit after seeing them live.